For those who want to get wet and play at the park at the same time, the Cityâ€™s Splash Pad located at the Sports and Events Complex is open for use to the general public. Water cannons and waterfalls all provide great ways to enjoy the summer. Best of all, theyâ€™re free! Our splash pad is surfaced with recycled rubber for traction and to keep the surface cool. Children must be supervised at all times. The splash pad is available form 6:00 AM â€“ 10:00 PM Monday â€“ Sunday, (seasonal) May 1st â€“ September 30. 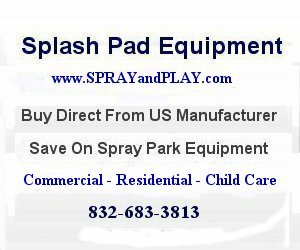 This entry was posted in Nevada and tagged Mesquite, Nevada, splash pad, Sports & Event Complex, spray grounds, spray park, waterplay. Bookmark the permalink.